I’m pretty sure that Disneyland is the Churro Capital of the World. So when the good folks there decided to build an awesome snack stand in the brand new Cars Land at Disney California Adventure, you better believe there were going to be some tasty takes on churros involved. And that is how the Churro Cone came to be at the Cozy Cone Motel! We’ve raved about all of the dishes here. 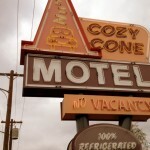 Most recently, I really enjoyed the Breakfast Cone paired with a Pear of Dice Soda. 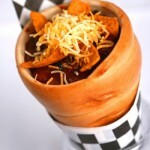 But we are also big fans of the Chili Cone Queso and gourmet flavored popcorns that they serve, too! On a recent visit, though, I learned something new! Many of the cones don’t open until 11AM…but the Churro Bites are available for BREAKFAST! 🙂 You’re welcome. And so I found a nearby cone-topped table and dug in. There are no surprises here where the churros are involved — they are hot and fried, perfectly done inside, and rolled in that crunchy sugar mixture that makes your day even better than it was before. The sauce is great, if a little watery. (Anyone know why the chocolate sauce at Disney always seems a little thin?!?) Chocolatey and cinnamoney, it’s a good complement to the bites. 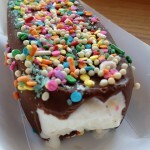 Overall, for the price, I might like to have my churro cone filled just a little bit more. Still, regarding taste and quality, this fun take on an old classic wins top marks from me! 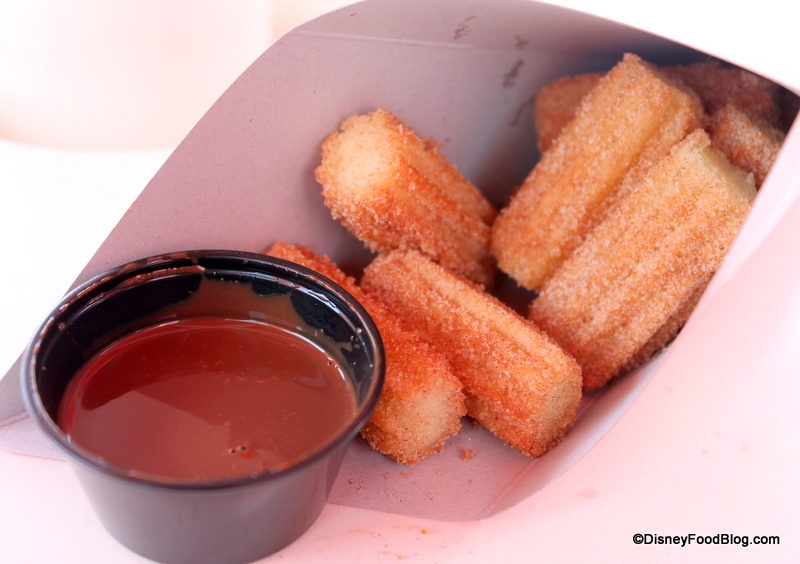 Will the Churro Bites with Cinnamon-Spiced Chocolate Sauce be a must have for you on your next visit to the Cozy Cone Motel? Let us know your thoughts in comments! 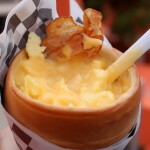 « The “DFB Guide to the 2013 Epcot Food and Wine Festival” Grand Launch and Discount! Had these back in March and liked the bites so much better than the full churros we’ve tried. I dumped the sauce – like you said, too watery. My husband is obsessed with anything that combines chocolate and cinnamon…sounds like I know where we’ll be having breakfast (and most likely lunch & dinner too!) whenever we make it out to Disneyland! I’ve never had a churro, but that said, these crunchy sugary bites look very tempting to me. And for breakfast? Yes, please. 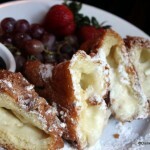 They remind of my favorite crispy, crunchy, French toast from the Crystal Palace in Disney World. And, I love chocolate, but I have to agree that that chocolate sauce looks rather pitiful and weak. I wish they served it with caramel sauce. I think that would be a better pairing. 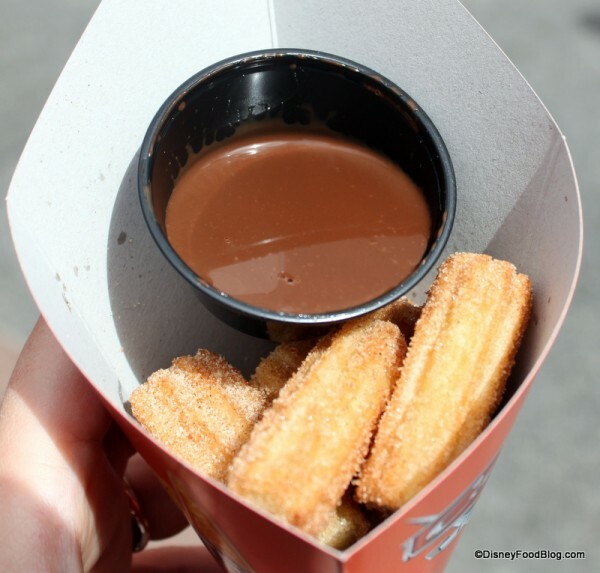 Straight up churros for me, please. They’re a much better deal for the price, and I’d dump that chocolate sauce anyway. I suspect that they are not stirring the sauce before serving, leaving the solids at the bottom of the container. Or it may be collecting moisture as it sits on a low simmer. My son tried the churros at WDW at the Mexico CS, and I believe they did serve them with a caramel sauce–which he distained because it was not chocolate or ketchup. My boyfriend LOVES DL’s regular churros so we may have to give this stop a try next time we are there. The sauce looks like it may have seperated a bit giving it a watery consistency. 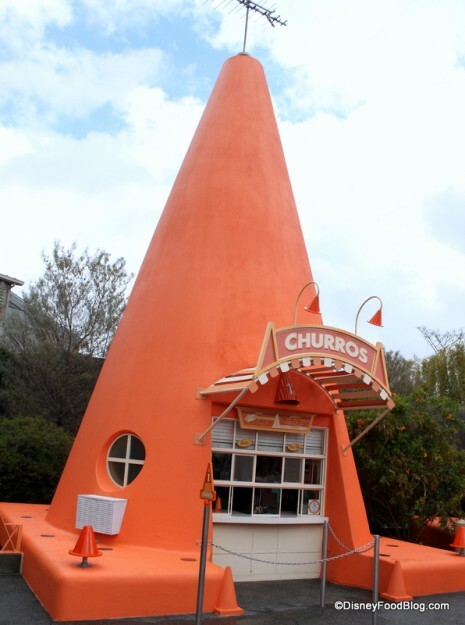 I’m thinking that those warm churros would taste great with a little ice cream over the top….ooooh or maybe a cone made out of churro to hold the ice cream!!!! I shared one with my sister one night and we really liked it, even the chocolate sauce. We just wished there was a compartment to hold the chocolate sauce in. Or at least a lid! Is there a gluten free option here?